Europa Oil & Gas has conditionally agreed to sell its 20% interest in UK onshore licence PEDL143 to UK Oil & Gas (‘UKOG’) for a total consideration of £300,000. The Sale is in line with Europa’s strategy to focus on its high impact portfolio of exploration licences in Atlantic Ireland, its existing producing assets onshore UK, and the Company’s pursuit of new ventures in its chosen areas of interest, specifically the Atlantic seaboard, North Africa and NW Europe. The Sale is subject to the signing of a Sale and Purchase Agreement, the terms of which have been agreed by both parties, and also approval by the Oil and Gas Authority. The Sale is to be settled in cash which, under the terms of the proposed SPA, Europa will then immediately, simultaneously and irrevocably use to apply for such number of ordinary shares in UKOG that is equal to £300,000 divided by 1.1560 pence per share, being the five day volume weighted average price on 12 April 2019. The Consideration Shares issued to Europa will be subject to a six month orderly markets provision. A further announcement will be made on completion. 'The sale of our remaining interest in PEDL143 demonstrates how we actively manage our portfolio of licences on a risk / reward basis. We will deploy corporate resources and capital elsewhere in our portfolio, mainly in monetising our industry-leading licence position offshore Ireland. Here gross prospective resources of up to 6.4 billion barrels of oil and 1.5 tcf of gas at our flagship Inishkea project have been identified, while farm-in negotiations are ongoing with a major international oil and gas company with a view to drilling up to three high impact wells from 2020 onwards. 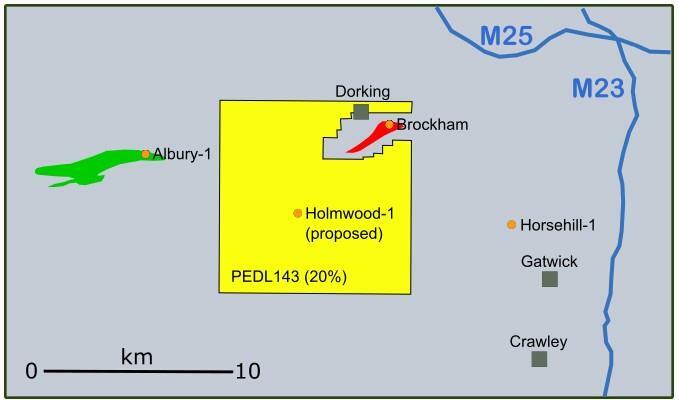 South of Dorking in Surrey, PEDL143 contains the Holmwood conventional oil prospect. Holmwood is predicted to have conventional Jurassic sandstone and limestone reservoirs which are proven to be productive at the nearby Brockham oil field and at the Horse Hill oil discovery. The Holmwood prospect has been assigned gross mean prospective resources of 5.6 million boe with a range of 1 to 11 million barrels. Were it to come in at 5.6 million boe, Holmwood would become the fifth largest onshore oil field in the UK.